David Granger received his Bachelor of Music in 1973 and his Master of Music in 1975 from the Manhattan School of Music in New York City. Mr. Granger was principal bassoonist of the Sacramento Symphony from 1981 until 1996. In 1983 he began teaching at the University of California, Davis, and, in 1985, became coordinator of the music department's student chamber music program. Mr. Granger works as a freelance musician performing in orchestras throughout northern California. He currently holds positions as principal bassoonist of the Sacramento Philharmonic, the Napa Valley, Modesto and Fremont Symphonies, and is a member of the Oakland East Bay and the Marin Symphonies. He joined the faculty of the University of California, Berkeley, in 2000. Mr. Granger attended Indiana University's Early Music Institute and received a Performer Diploma in baroque bassoon in 2004. He performs on a copy of a 17th century dulcian made by Leslie Ross, NYC, 2000 and a baroque bassoon made by by Guntram Wolf, 2003, and copied after an instrument with the initials HKICW. A native of Berkeley, California, Jonathan Davis holds a Master of Music degree in harpsichord performance from the Mannes College of Music in New York City where his principal teachers included Arthur Haas and Myron Lutzky. In New York, Jonathan performed, with the New York Continuo Collective under the direction of Stephen Stubbs, La Rappresentatione de Anima, e di Corpo by Caelliere, on period instruments. While an undergraduate at the San Francisco Conservatory of Music, Mr. Davis was Laurette Goldberg's teaching assistant. Mr. Davis is the recipient of outstanding performance awards from the Mu Phi Epsilon Honors Foundation, the San Francisco Conservatory of Music, and the Mannes College of Music. As the winner of the 2003 Indiana University Baroque concerto competition, Jonathan was a featured soloist with the IU Baroque Orchestra. Mr. Davis has performed throughout Italy as a soloist and chamber musician, most recently at the Accademia Bartolomeo Cristofori, Florence, Italy. Edwin Huizinga can be found touring with baroque and folk bands all around the world. This past season Edwin toured Canada and Europe with the Tafelmusik Baroque Orchestra as well as with the Wooden Sky, and can be found performing with many different chamber ensembles globally. Edwin is a member of the Academy Chamber Series, Acronym, the Yegada Trio, and has been a guest with many ensembles such as ifuriosi, Aradia, the Atlanta Baroque Orchestra, Nota Bene, Brandywine Baroque, Apollo's Fire, and more. Edwin tours with the Wallfisch Band, and has worked under the direction of Gustav Leonhardt. Recently Edwin made his Carnegie Hall debut performing with the Theatre of Early Music. During the Summer months Edwin can be found performing and soloing with the Carmel Bach Festival, performing with the Trinity Alps Chamber Festival, and in 2013 Edwin will begin as Artistic Director of the Big Sur Camp in California. Adriane Post has been described as one of North America's "brightest and best" by Early Music America (Fall 2012). She has appeared as concertmaster and soloist with Juilliard415 under the direction of Jordi Savall and Nicholas McGegan and leads in New Trinity Baroque as co-concertmaster and soloist. Adriane can be heard in ensembles such as Apollo's Fire, Trinity Wall Street Baroque Orchestra, Washington National Cathedral Baroque Orchestra, Handel and Haydn Society, and Sarasa Chamber Music Ensemble, Opera Lafayette, the Knights and A Far Cry among others. Based in New York, Adriane is a member of the Diderot string quartet, specializing in historical performance of classical through early romantic repertoire. Recent festival performances include the Carmel Bach Festival, Piccolo Spoleto, and Ravinia. Touring in the US and abroad this season has brought her to The Kennedy Center, Alice Tully Hall, Severance Hall, Teatro Real in Madrid, and the Grand Théâtre de Bordeaux. Adriane received her BM from Oberlin Conservatory and her MM as part of the inaugural class of Juilliard's Historical Performance program. Her principal teachers include Nicholas Kitchen, Marilyn McDonald, Cynthia Roberts and Monica Huggett. She performs on an 18th century copy of an Amati violin. Adriane is from Charlotte, VT, and remains a proud Vermonter. Cited for his "stylish and soulful playing" by the Atlanta Journal-Constitution, Josh Lee leads a mixed up musical life performing on viols and double bass with some of the world's leaders in early music. An alum of the Peabody Conservatory and the Longy School of Music, he studied double bass with Harold Hall Robinson and viols with Ann Marie Morgan and Jane Hershey. Josh is the founder of the ensemble Ostraka, and has performed with the Los Angeles Philharmonic, Boston Early Music Festival Orchestra, Carmel Bach Festival, Musica Pacifica, Atlanta Baroque Orchestra, Wiener Akademie, Indianapolis Baroque Orchestra, New Trinity Baroque, Musica Angelica, Hesperus and Philharmonia Baroque Orchestra. Josh's performances have been heard on Performance Today and Harmonia, and he has recorded for Dorian Sono Luminus, Reference Recordings, NPR and Koch International. A resident of San Francisco, Josh is director of the Viola da Gamba Society of America Young Players' Weekend. John Lenti's playing on theorbo, baroque guitar, and lutes has been described as "a joy to behold" (Seattle Times) and praised for its "nuanced beauty and character" (Gramophone). He regularly deploys his "uncommonly big sound" (Third Coast Digest) in concert and on record to considerable acclaim as a soloist and accompanist with groups like Apollo's Fire, Haymarket Opera Company, Magnificat, Portland Baroque Orchestra, Seattle Baroque, and Seraphic Fire, among many others. As a founding member of ensembles Plaine & Easie and Wayward Sisters, he twice took top prizes in Early Music America competitions. Other ongoing ensembles include Ostraka (Florida), Sacro Profano (Seattle/NYC), and the I-90 Collective (Montana/NYC). John studied lute with Nigel North, Jacob Heringman, and Elizabeth Kenny and holds degrees from Indiana University and the North Carolina School of the Arts. Additional musical help and inspiration came from Ricardo Cobo, Ronn McFarlane, Pat O'Brien, and Walter Gray. A versatile concert violinist, Alicia Yang specializes in historically-informed performances of music spanning four centuries. Recent appearances include such diverse ensembles as the Philharmonia Baroque Orchestra, baroque band Archetti, San Francisco Symphony, and Sun Valley(ID) Summer Symphony. 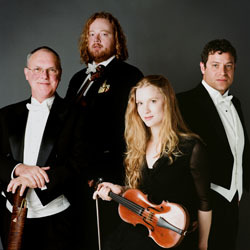 A former member of the Oregon Symphony and the Orquesta Sinfonica de Castilla y Leon (Spain), she has also performed extensively in the Seattle Symphony, as well as with period-instrument ensembles the American Bach Soloists, Carmel Bach Festival, Seattle Baroque, Portland Baroque Orchestra, Smithsonian Chamber Players, and Violins of Lafayette. Her training at the Oberlin and New England Conservatories spanned genres from Renaissance to contemporary, and she has recorded an album of contemporary compositions on the Opus One label. Ms. Yang enjoys maintaining a private teaching studio, as well as playing chamber music with her husband Amos Yang, assistant principal cello of the San Francisco Symphony, and spending time with her children, Isabel and Noah. Dr. Ondine Young directs choirs and string courses for all ages at the Crowden School, and Kairos Choir. She also teaches recorder, tin-whistle, piano, and other music & movement classes at Tehiyah, the East Bay Jewish Community Center, and Carmel's "Bach to the Future" summer camp as part of their Bach Festival. Ondine maintains a private teaching studio: Arlington Arts, and has taught music at many public and private institutions including Oxford Elementary in Berkeley, San Francisco Boy's Chorus, Waldorf, Le Lycee La Perouse, and the German International School of Silicon Valley. After studies at UC Santa Cruz and UC Santa Barbara, Ondine completed a doctorate in musical arts in choral and early music at the University of Southern California, and formerly served on the faculty of the University of San Diego. Ondine assists her husband, cellist William Skeen with www.lamonicaensemble.com and other local groups.